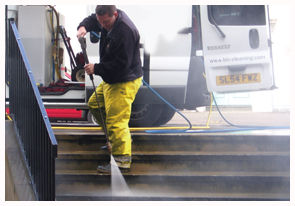 Powerwash cleaning is a low cost, highly effective system for cleaning all manner of hard surfaces. We specialise in all aspects of window, UPVC and facade cleaning. All staff are highly trained and experienced. Graffiti is like a magnet. It attracts more graffiti unless it is removed promptly. We have a team of after builders cleaners who specialise only with after builders cleaning. BLC Cleaning Services is a well established Edinburgh based company specialising in all aspects of cleaning including window, UPVC and Facade cleaning. Our friendly, efficient approach has ensured that we have become an established and trusted name throughout Edinburgh with a reputation for excellent contract cleaning and courteous, professional service. Our range of services includes power washing, graffiti removal, window cleaning, patio cleaning, monoblock cleaning and drive cleaning. We also specialise in one off cleans, commercial cleaning and builders cleans. We work hard to maintain the professional standards required to ensure that you receive only the best window, UPVC and facade cleaning service available.